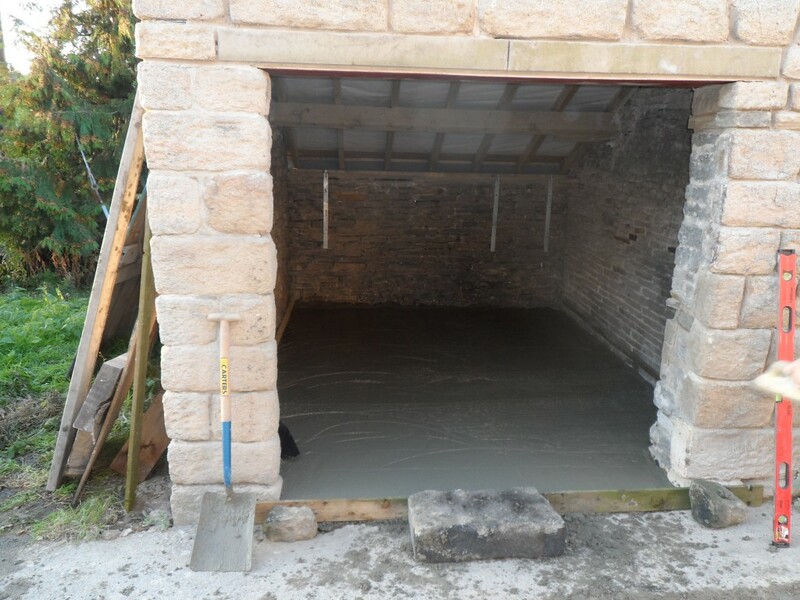 We laid the new concrete floor in the outbuilding yesterday. 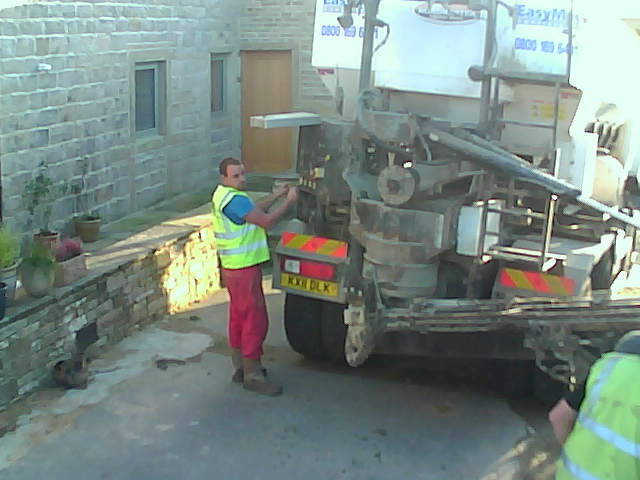 The concrete (around 2.5 tonnes) was due to arrive at 3pm, but eventually got here at 5:30pm (shortly after we had packed up our tools and decided to go down the pub!). Once it arrived, we had little choice but to lay the floor. In the end, it only took about an hour, but it was at the end of the day and it felt like a very long hour. Earlier in the day, I had laid some rubble at the far end of the floor in an attempt to level it up a bit. 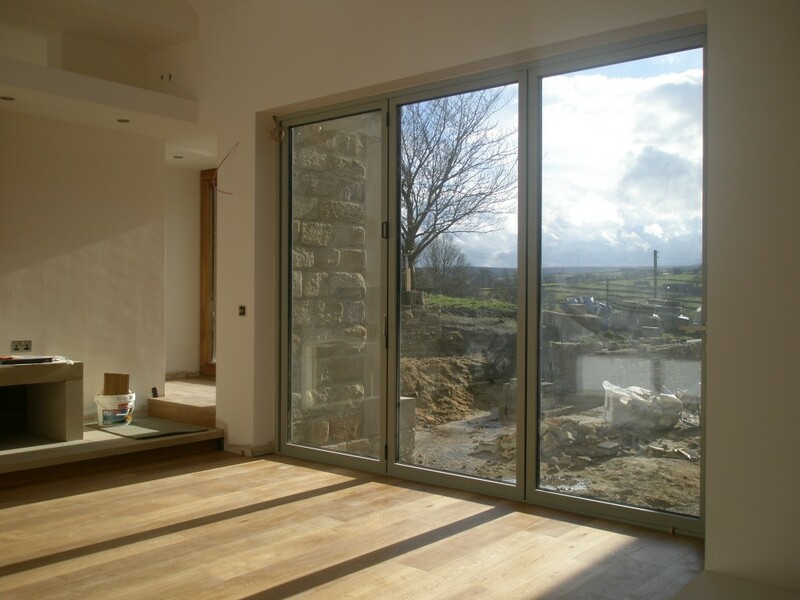 We want the finished floor level to be higher than the drive outside (so water doesn’t run in) and sloping slightly to the front (so if water does get it, it will flow out). I use the rubble to level up the worst of the floor and then put some crushed stone on top (about 1 tonne). This was then compacted with a Wacker plate rented from a local hire shop. Then we put down some Visqueen damproof membrane and then a couple of tonnes of concrete on top. 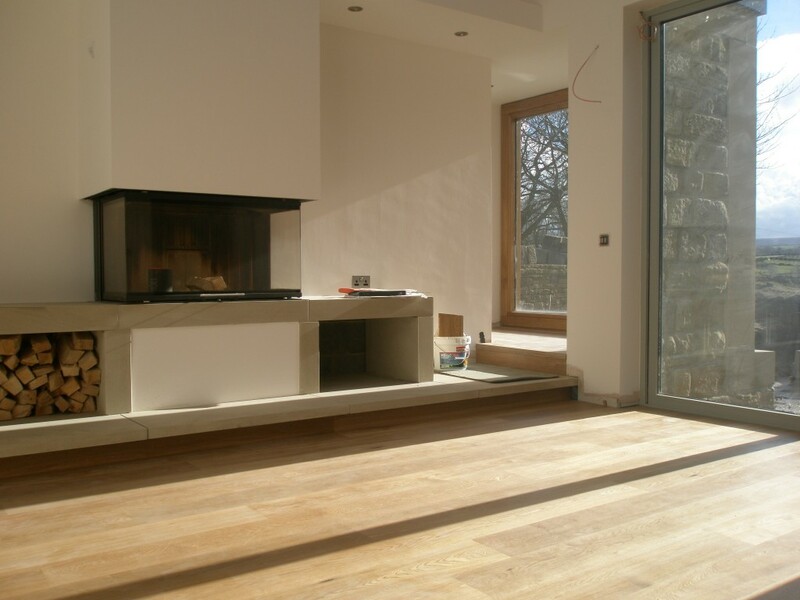 The concrete came from Hi Spec concrete in Huddersfield. The machine mixes the concrete on site and we were fortunate to be able to shoot it straight into the outbuilding. There was still a lot of shovelling to do to get it into all the right places, but shooting the concrete right in makes life a lot easier. The finish is pretty good and at the end of the day, it is a shed! However, pride kicks in and you want to make it look the best you can. 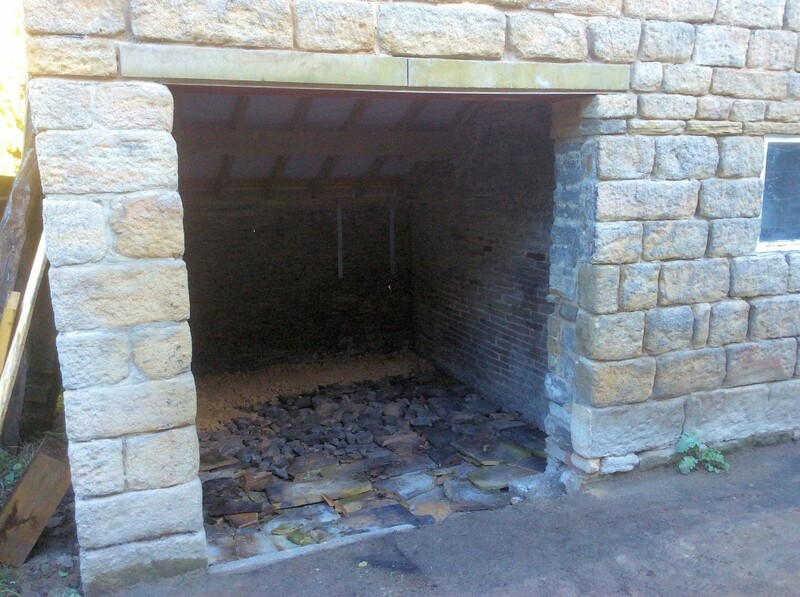 The original floor in the outbuilding sloped to the back. To correct this, I put some rubble at the back and some old stone slates at the front. Then covered it with crushed stone which was then compacted. This corrected the floor level as well as helping raise the finished floor level above the drive outside. There is a layer of rubble underneath the crushed stone that has helped level out the floor. This now needs to be compacted before the damp proof membrane is put down and the concrete laid. The finished floor level needs to be just a tad higher than the drive outside (this will stop water running in). One of the pictures off one of our security cameras. The concrete is mixed as it is delivered by the machine. The concrete is metered so you only have to pay for what you use. We thought we only needed about 1 cubic meter, in the end we required 1.75 cubic meters! If you order it the traditional way, you would over order to guarantee that you have enough to finish the job. This isn’t great but it is better than being short! However, it does mean that you frequently have surplus concrete to get rid of at the end of the job. 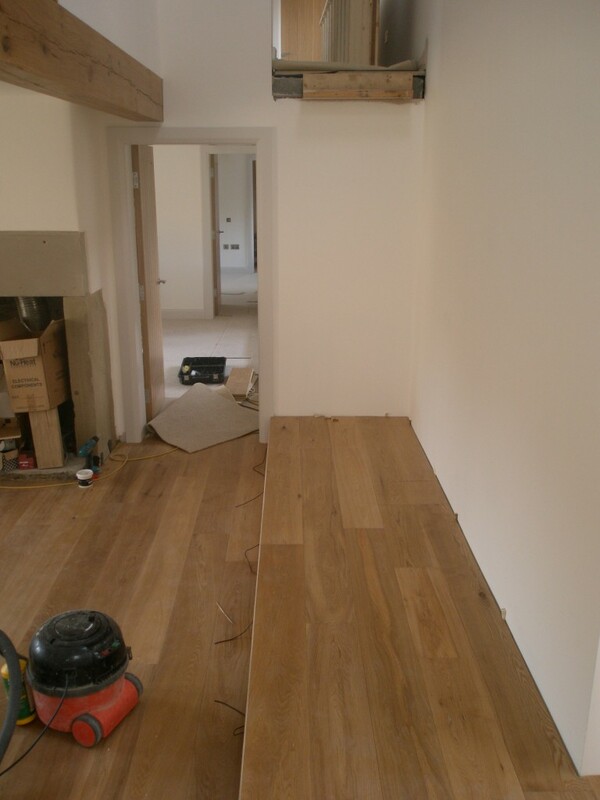 We used some battens along the wall to mark the top of the finished floor level. This is a piece of timber along the front to create the step into the shed. This should be dry enough tomorrow to walk on. All the timber flooring was finished yesterday and today it was the job of sanding the floors and applying the final coat of varnish. The timber boards had already had a couple of coats of varnish before being laid, but the final coat seals the floor and all the joints between the boards. It takes around four hours to go off, but it is best left overnight. Once the varnish has set, we will fit the skirting boards. These have already had one coat of paint. They will need a second, but at least one coat speeds up the process. The varnish is a satin matt. It only looks glossy in the photo below as the varnish is still wet! The timber boards already have a couple of coats of varnish on them before they are installed. Once the boards are laid, they are sanded and then a final coat of varnish (polyurethane based) is applied using a felt pad. The varnish is poured into a plastic bin bag in a crate. 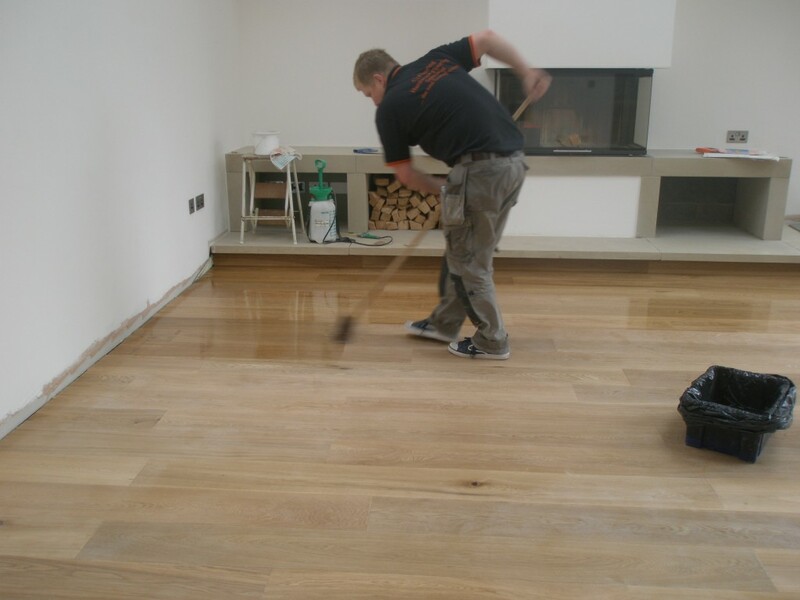 This enables them to dip the pad fully into the varnish before applying. 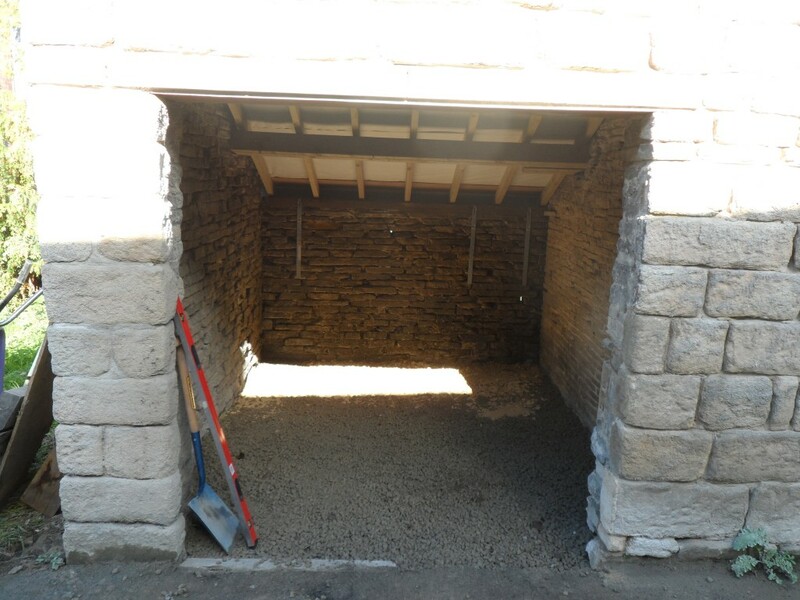 We re-built the old coalhole that was on the end of the building. It had to be re-built as it was damp and very dark. We finished the flooring in here yesterday and once the varnish has gone off, it will be time to install the skirting boards. It is a great space – a little quirky – but it just adds character to the room. Adding skylights and increasing the size of the window has increased the light here as well as increasing the sense of space. We added these skylights to the coal hole to bring in extra light. We also doubled the size of the window to the left for the same reason. This space is now much lighter – it also feels much bigger than before we rebuilt it (even though it is exactly the same size). It is amazing what difference the light makes. This room used to be the old coal hole. The door to the left leads to the outside. 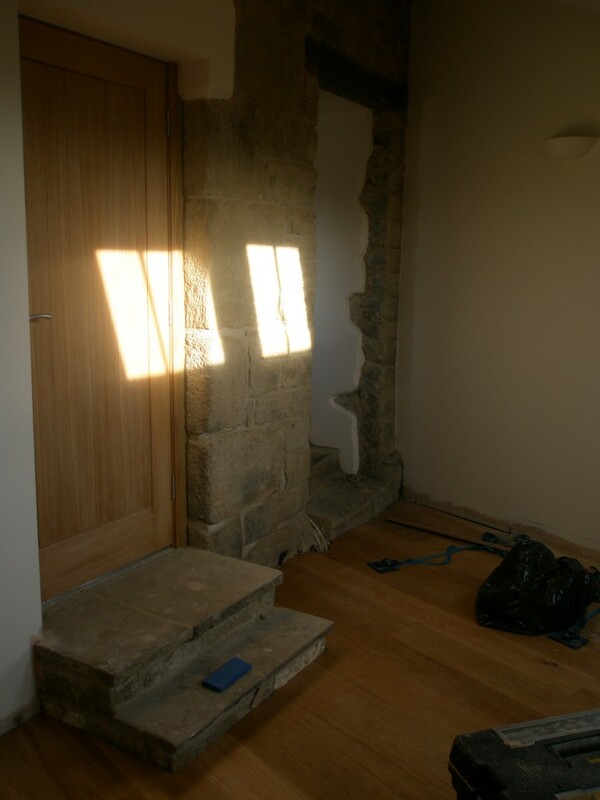 The steps have been built using flagstones that we reclaimed from the kitchen. The door to the right leads into the main house and I suspect that this used to be the original door into the property. It ceased to be used as the front door when the coal hole was built – the coal hole is on the 1768 map, so this doorway pre-dates that – the steps are original (the bottom step forms part of a foundation stone) and show significant signs of wear. We finished the timber flooring in the hall yesterday including the flooring that covers the step for the stairs to sit on. The staircase that we are currently using is temporary while the finished staircase is being built. We weren’t sure about the step when it was first built. It seemed a bit out of place, but now it is clad in timber, it looks better. We are still not totally convinced, but we are going with it for the time being. The addition of the LED lights (front and back) make it look like it is there on purpose (and not just covering up some pipework!). This is the timber step that the new stair case will sit on. 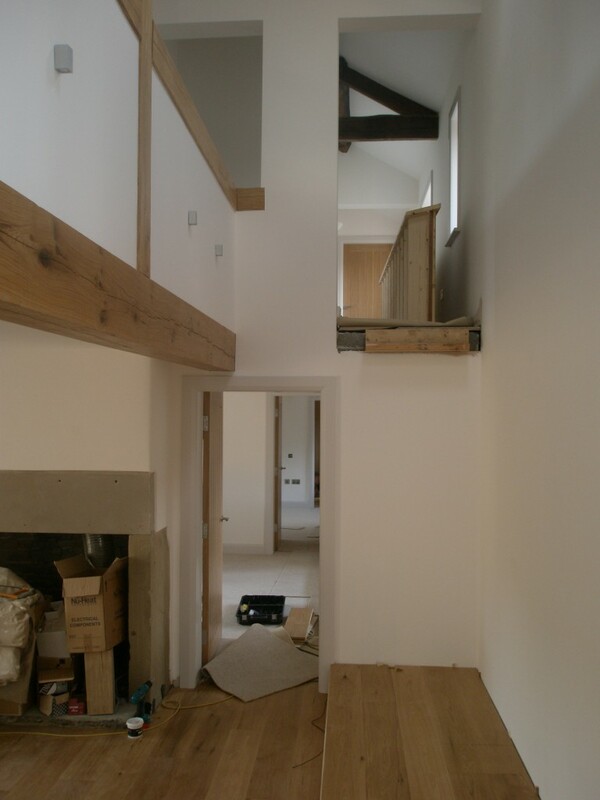 The temporary staircase has been removed so that the platform can be covered in timber flooring. The LED lights that are in the step have been snipped off – the wires have been fed through the holes and will be reconnected to the LED lights before being put back into position. There is a floor box in the centre of the hallway. This has a couple of electrical sockets plus an ethernet socket and a controlled light connections. This means that we can put a lamp on a table in the centre of the room without cables laying across the floor. Since the light is connected to the Loxone kit, it can be controlled in exactly the same way as all the other lights in the house. The cover of the floor box is covered in timber flooring to match the floor. The platform that the new stairs will sit on is also covered in timber flooring and this means that the temporary stairs need to be removed. You can see them on their side upstairs. The bulbs for the LED lights have been snipped allowing the cables to be fed through the holes in the timber flooring. These will then be re-jointed and the LEDs put into position. Another view of the platform for the new staircase. With the tiles in the kitchen laid and grouted, it is now time to turn our attention to the boot room and utility room. 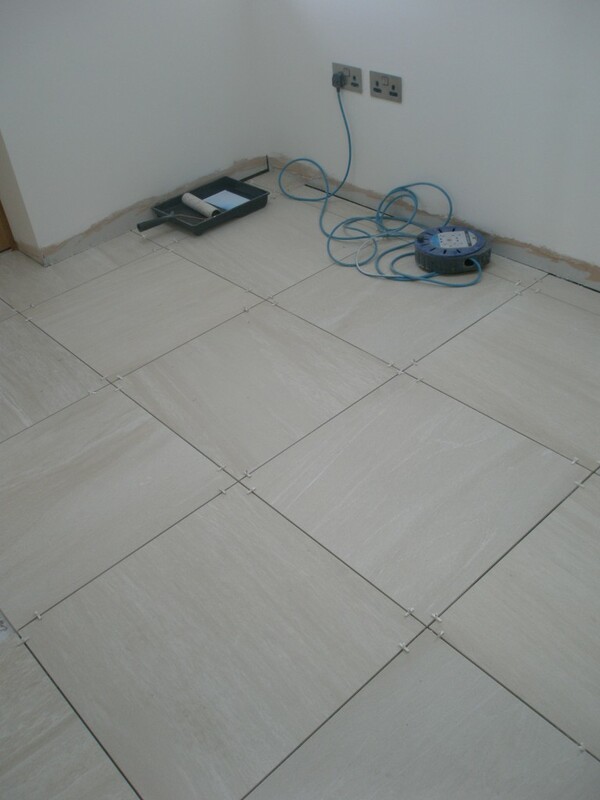 We are using the same tiles as in the kitchen and the tiles will be laid as a continous run. 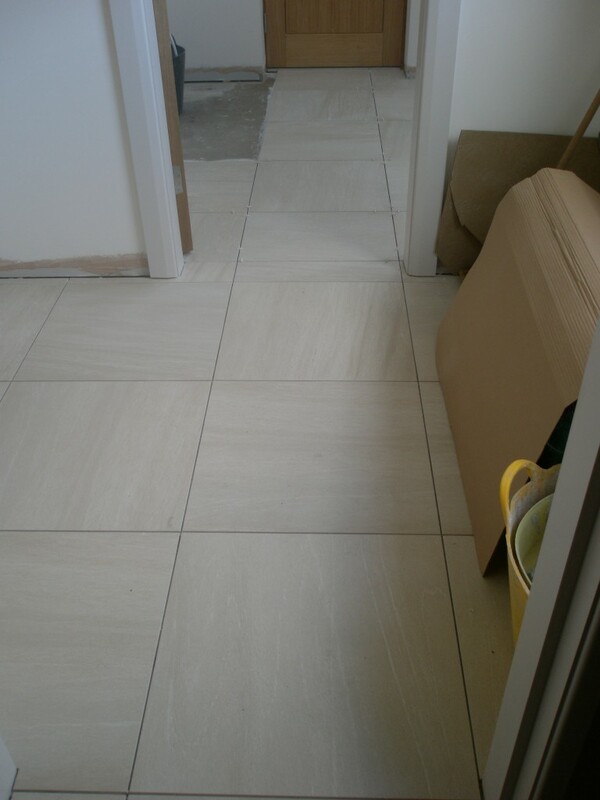 John made a headstart on tiling the utility room last week and today the boot room has been tiled. 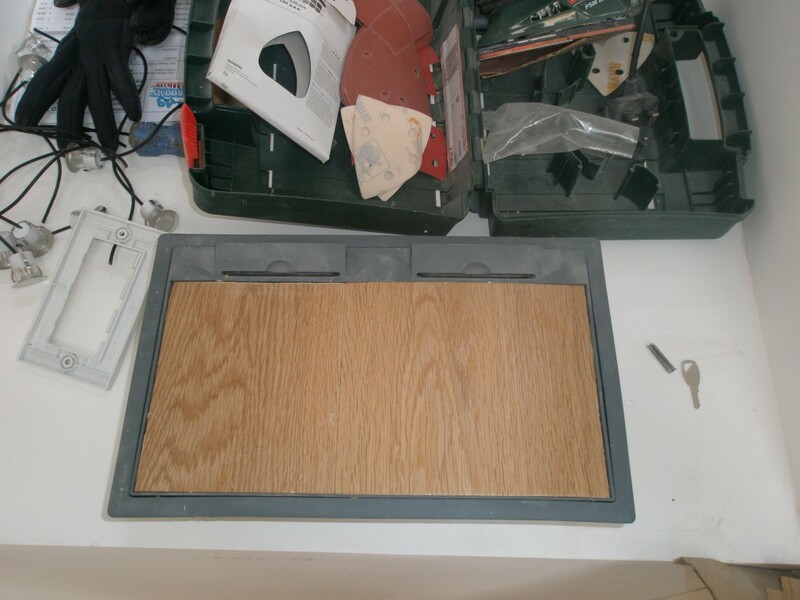 We are still waiting for the shower tray for the boot room – this will be used to wash the dog and wellies – but hopefully it should be ready to be picked up today. We are using the same tiles as in the kitchen. In the far room, the boot room, there will be a showe to the left for washing the dog and wellies. The underfloor heating has been turned off in here while we are doing the tiling. There is a shower tray to go in this position for washing the dog and muddy boots. Our guess is that we will use this entrance most of the time. We have picked a shower tray with a cup that allows us to remove any silt that might build up. The two white pipes are the hot and cold for the shower attachment. 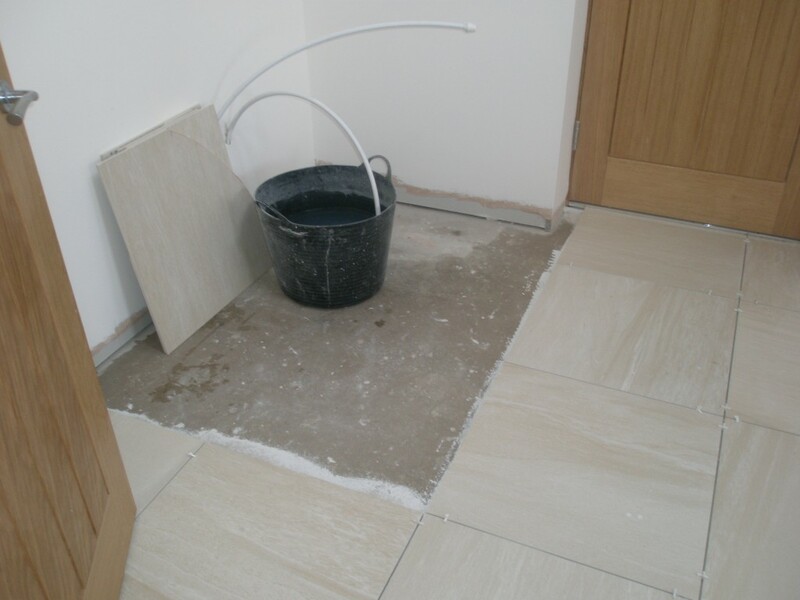 We have used the same tiles in the boot room and utility room. These still have to be grouted. The timber flooring is all done now in the lounge. 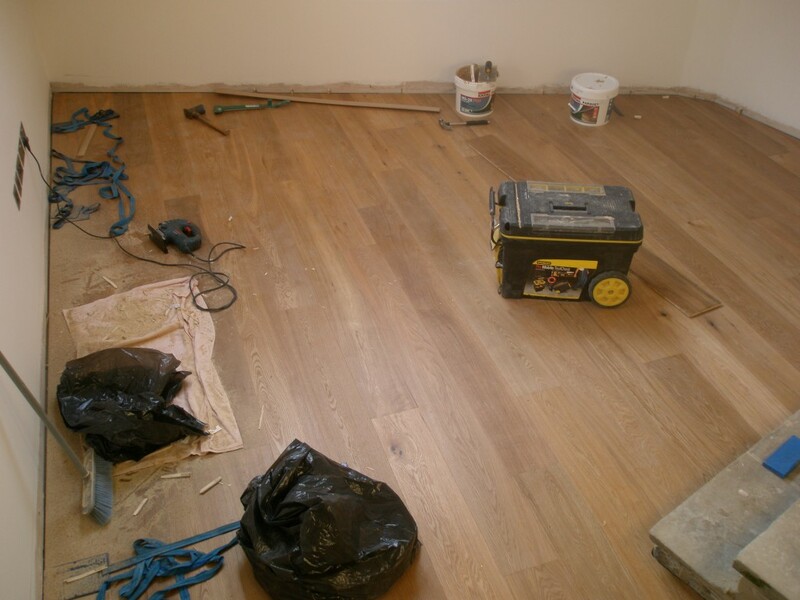 There are three rooms with timber flooring and we managed to get 1.5 done today. The rest will have to wait until next week. We are now in a position for the skirtings to be put on now that the floor is down. There a few cables left over here and there, but we are almost there. The new timber floor is down in the lounge. This was all installed in a day (together with making a start in the downstairs study). 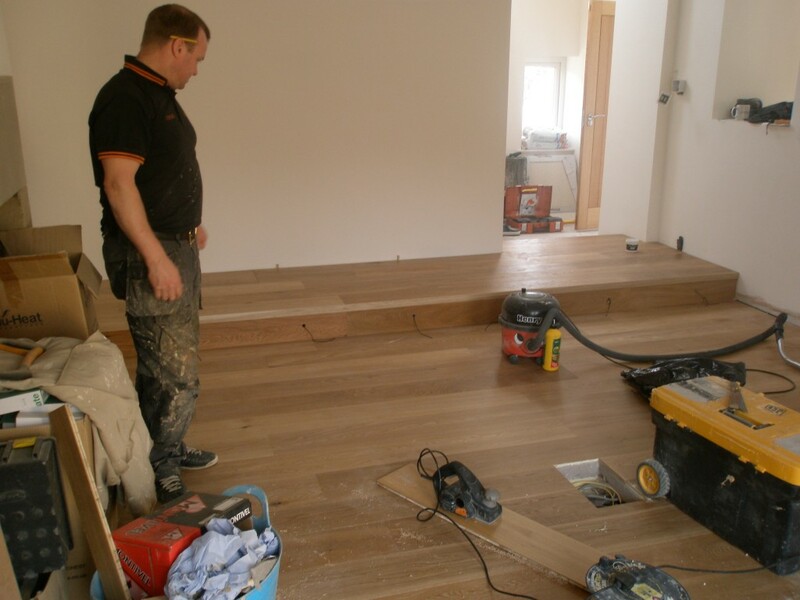 Now the carpets are down, it is time to start on the timber flooring. 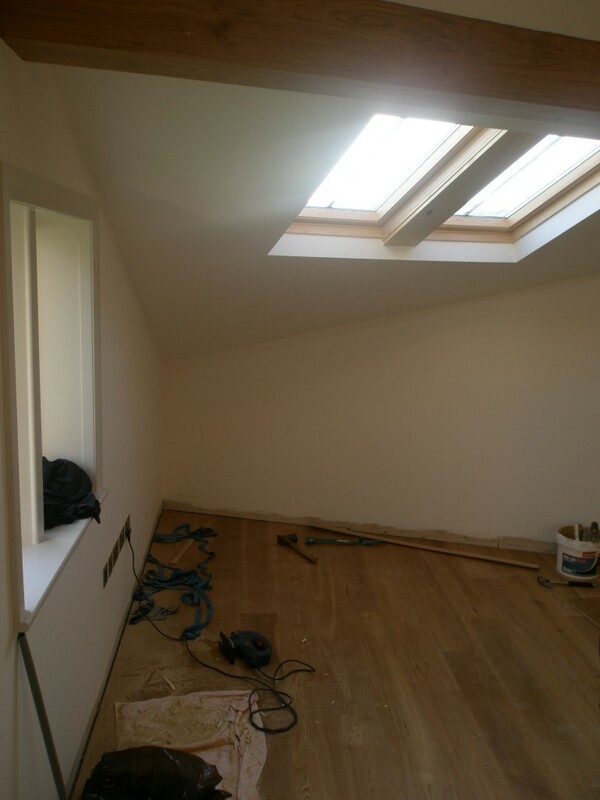 There will be timber flooring in the lounge, hall and study. Since the lounge is on the same heating zone as the kitchen, the underfloor heating has been turned off for the last week or so. 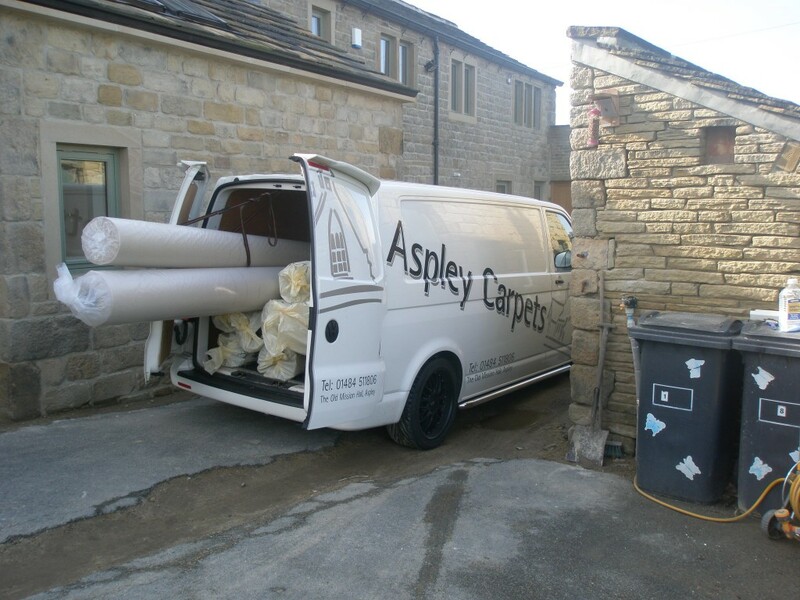 The flooring is being installed by CJ Flooring in Huddersfield. 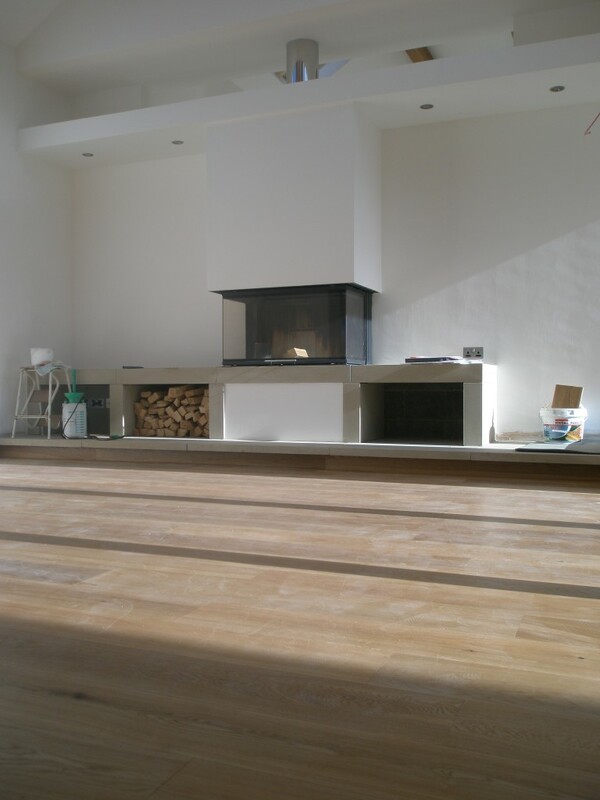 The timber flooring has to be made from engineered boards rather than solid boards. This is due to the underfloor heating. The boards are glued onto the concrete screed. This helps with the heat transmission through the floor. 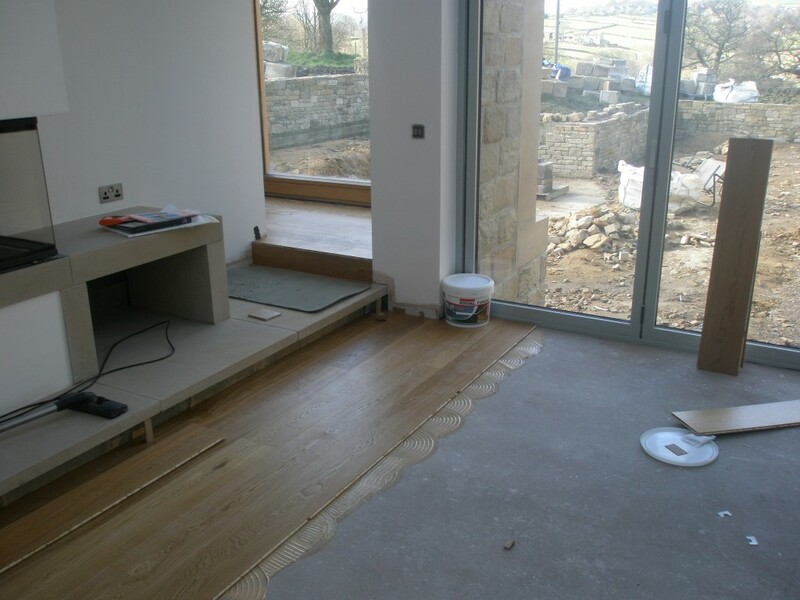 We have started putting the timber flooring down in the lounge. The underfloor heating in here has been off for the last week or so since it is on the same zone as the kitchen where we have been tiling the floor. 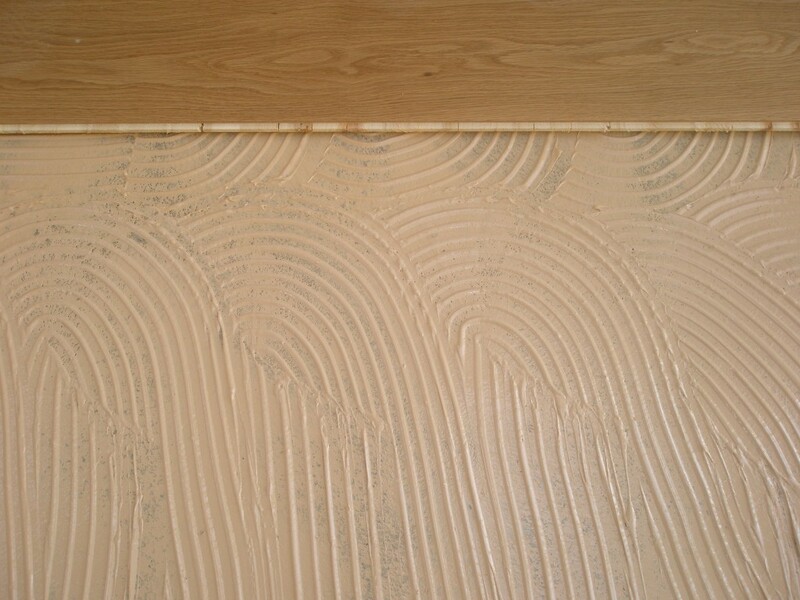 The timber flooring is glued to the cement screed. This helps transmit the heat from the underfloor heating. The glue goes off in about 4 hours, but in practice you can walk on it straight away as long as the boards are tightly fitting. The tiling in the kitchen is all done. And in just 4 days! The grout will go off overnight and then in about a week’s time we should be able to turn the underfloor heating back on. It takes this long for the tile adhesive to fully set. The last bits of upstand were installed this morning, then the whole of the floor has been grouted. 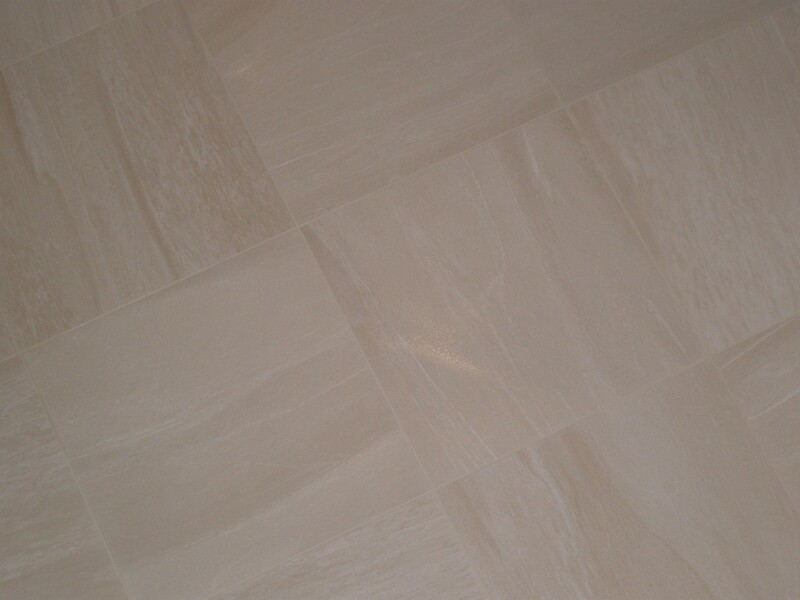 We are using a slightly off white (actually Jasmine white) grout to blend in with the colour of the tiles. It is difficult to see here, but we are using jasmine white grout to blend in with tiles. These should be dry enough to stand on tomorrow and then we can turn the underfloor heating on in about a week (we need to give the tile adhesive time to go off completely). 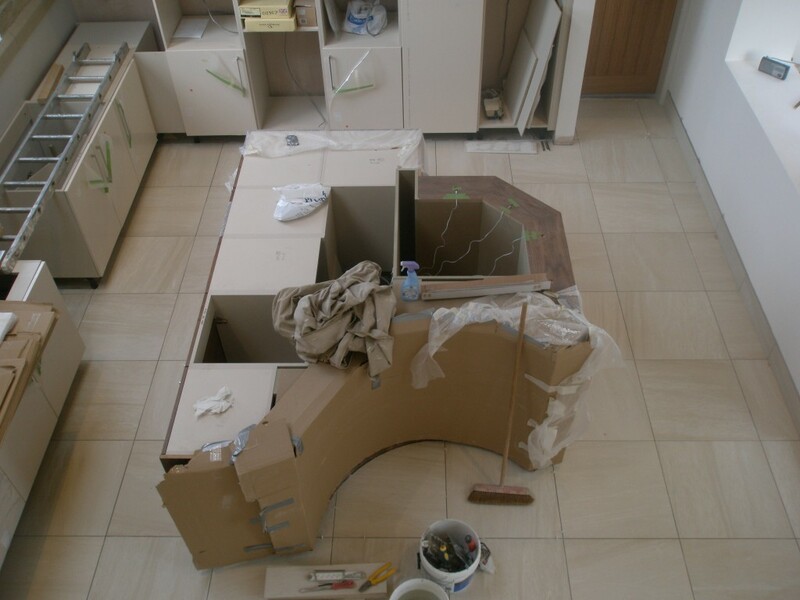 Almost of the tiles are down in the kitchen – there are just some upstands (tile skirtings) to install at one end of the kitchen. Tomorrow, the tiles will be grouted before the kitchen appliances are installed on Friday. We are still waiting for an update on the sinks. 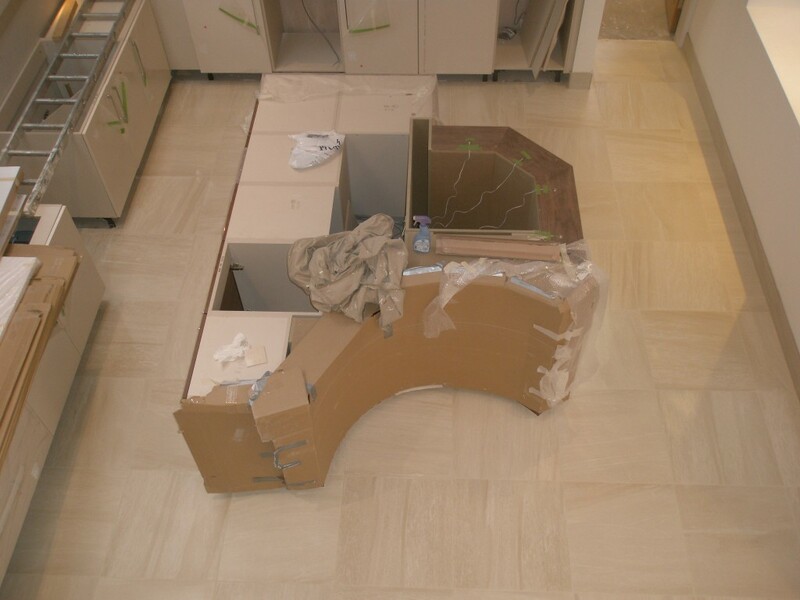 Until these arrive, the granite worktops cannot be finished or installed. Last we heard, two out of three of them were on their way from Spain! All of the cuts around the island unit have now been completed. The upstands (tile skirtings) have also been done. Grouting tomorrow. 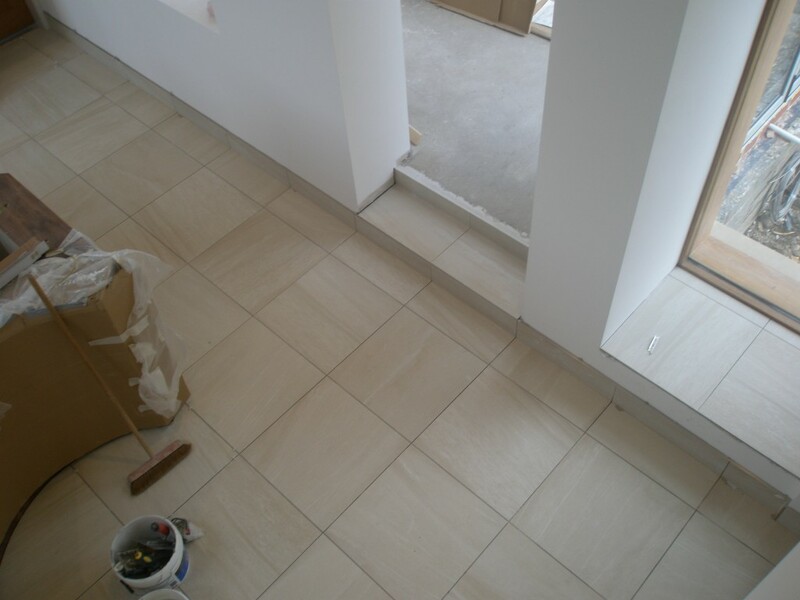 The tile upstands (tile skirtings) are now in place as well as the tile step into the lounge – there will be timber flooring in the lounge. We have also tiled the window cill to the right of the step. Longer term, there will be some artwork here. 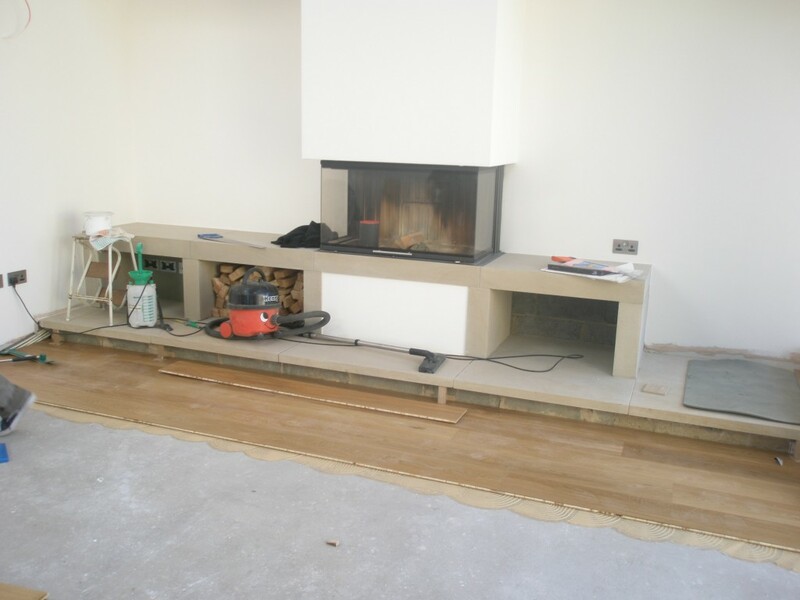 The timber flooring in the lounge should be installed later this week (or maybe early next week). We are using low TOG (0.8) underlay because of the underfloor heating. 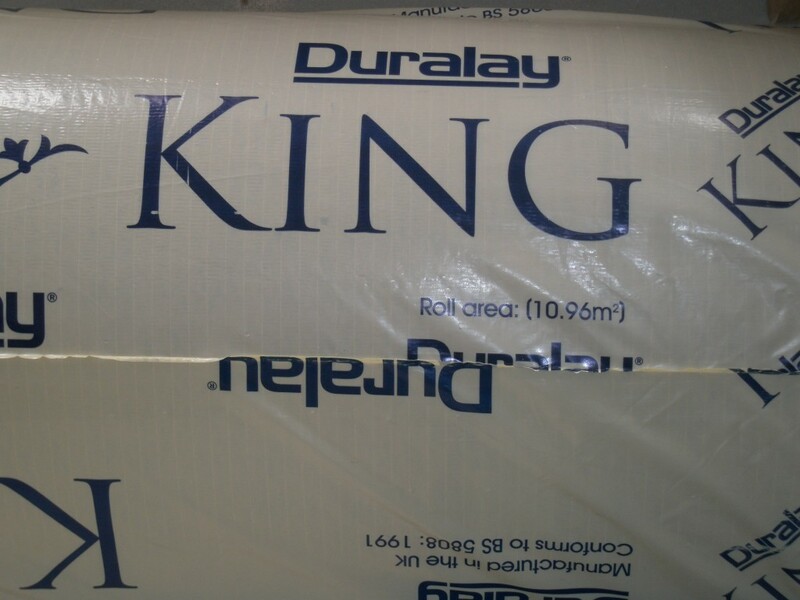 Bizarely, the underlay is heavy, but it is about the heat transmission quality of the underlay rather than the weight of the material. The carpet is also a low TOG (1.4) carpet from the Cormar Glendale range. As we have tried to do throughout the project, we are using local suppliers. We should get the upstairs and a couple of rooms downstairs done over the next couple of days. MMmmmm….I don’t think there was much room left over. 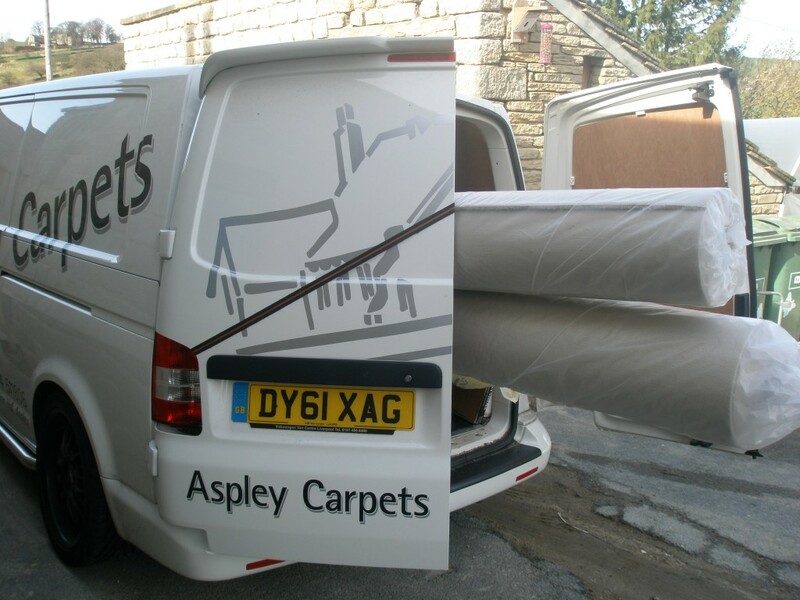 The underlay for the carpet needs to have a low TOG value to ensure that the heat from the underfloor makes it through both the underlay and the carpet. This underlay has a TOG value of 0.80. The carpet has a TOG value of 1.4 (Cormar Glendale range).